Author Greg Kuhn is a professional educator and a futurist, specializing in framing new paradigms for 21st Century living. Since 1995 Greg has written for his father, Clifford Kuhn, M.D. about health, wellness, and personal growth, crafting five self-help books for him and over thirty self-help articles for publication. 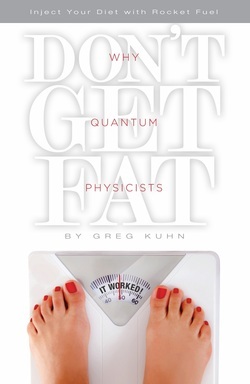 Recently Greg published Why Quantum Physicists Don't Get Fat, which is a portion of his larger self-help quantum formula, teaching people with unwanted weight how to finally lose it using quantum physicists. Why Quantum Physicists Don't Get Fat has earned praise from both nurses and physicians alike. In addition to performing entertaining and well-received speaking engagements and media interviews about quantum physics' power for personal growth, Greg also collaborates and speaks with Intentional Wellness, a Louisville, KY-based organization of doctors, nurses, and nutritionists who actively train people to have healthier lifestyles. Since 1992 Greg has also served the Louisville, KY community as a high school coach, teacher, and administrator. He has been active in a variety of leadership roles such as training student teachers, mentoring new administrators, and working within the Jefferson County Public School system to help new magnet school programs become established. Finally say goodbye to unwanted weight! 1. Have you tried to lose weight only to wind up gaining it all back (and more)?